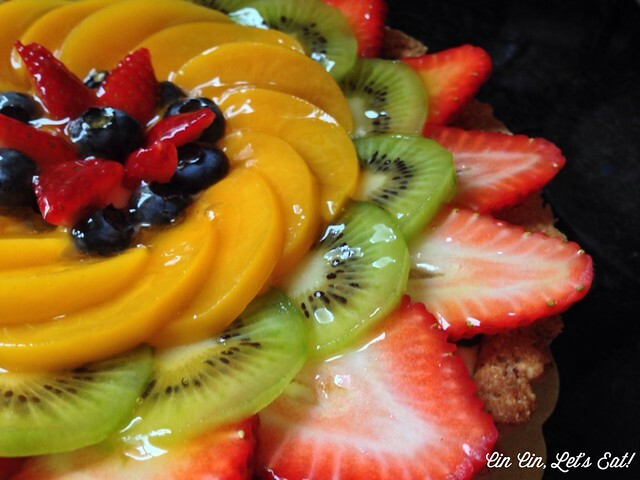 Fruit Tart [recipe] – Cin Cin, Let's Eat! Happy Monday! 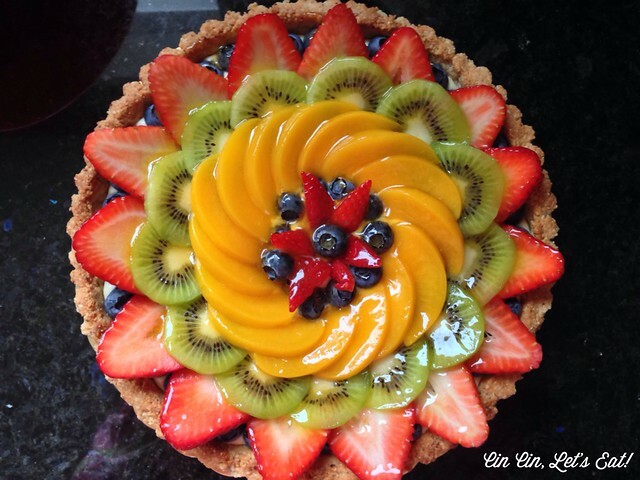 I wanted to start this week with a very colorful fruit tart to brighten up your day. 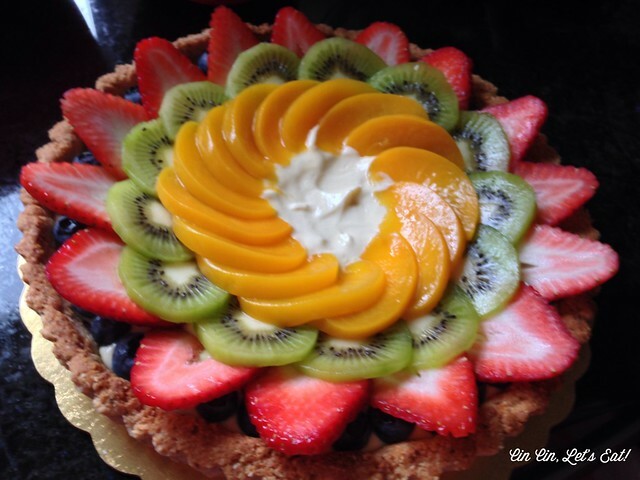 This gorgeous tart is very easy to put together, just remember to use great quality ingredients to really make this dessert shine. I normally like to use whatever fruit is in season, and luckily being in California, I can get fresh and sweet berries all year round. I do like to incorporate some canned peaches and apricots but that’s as far as I would go for using canned products in this tart. And you certainly don’t need to arrange the fruit like I did. If you are using assorted berries, just pile them on and don’t worry about glazing the tart with jam, do a simple dusting with some powdered sugar right before serving. 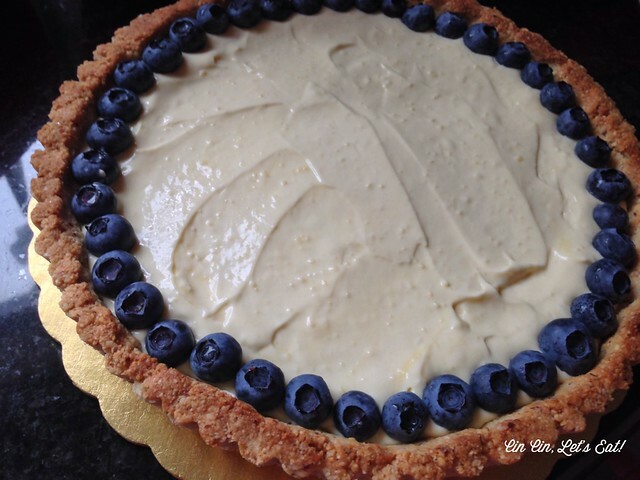 And I LOVE a nice nutty crust, but feel free to use your favorite tart shell recipe, will be just as scrumptious. Make this 1st, can be made up to 3 days in advance. Meanwhile, in a saucepan bring the milk just to boiling (just until milk starts to foam up.) Remove from heat and add slowly to egg mixture, whisking constantly to prevent curdling. Then pour the egg mixture into a medium saucepan and cook over medium heat until boiling, whisking constantly. 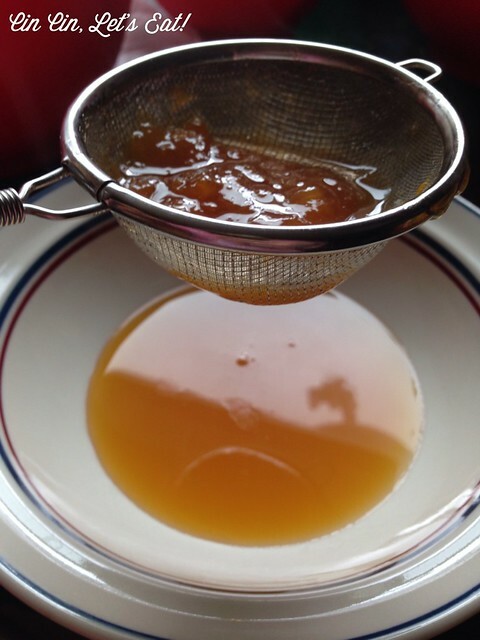 When it boils, whisk mixture constantly for another 30 – 60 seconds until it becomes thick. Remove from heat and immediately whisk in the liqueur (if using). Stir in vanilla extract, and pour the mixture through a strainer into a clean bowl and immediately cover the surface with plastic wrap to prevent a crust from forming. Cool to room temperature. If not using right away refrigerate until needed, up to 3 days. Right before using, whip the cold heavy cream until soft peaks form. 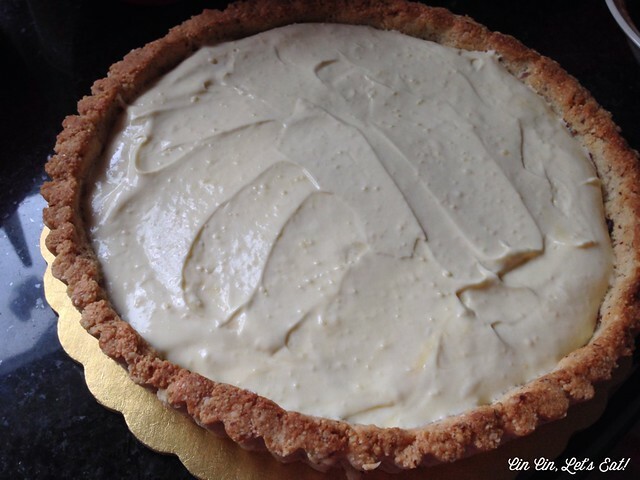 Fold in the whipped cream to the chilled pastry cream. 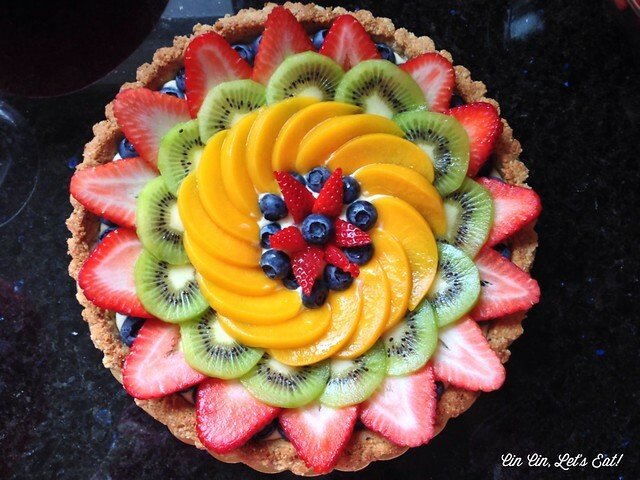 Make this day the day you are ready to assemble the tart. With a fork, tossing together almond meal, sugar, butter, egg white, and salt. Press the mixture evenly over the bottom and up the sides of a 9-inch tart pan with a removable bottom. Bake for 22 minutes or until golden brown. Let it cool in pan for 10 minutes, then remove from pan and let cool completely before using. 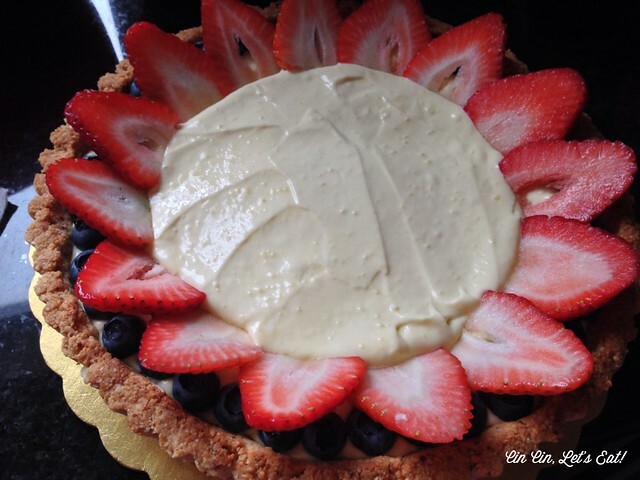 Make this while the tart shell is baking in the oven. In a small saucepan, heat cream over medium-high heat to a simmer. Place chocolate in a medium heatproof bowl and pour hot cream over the chocolate. Let stand for 1 minute. Slowly stir chocolate mixture with a silicone spatula to combine. Add butter or corn syrup and whisk mixture until smooth. Let cool, stirring every 10 minutes. 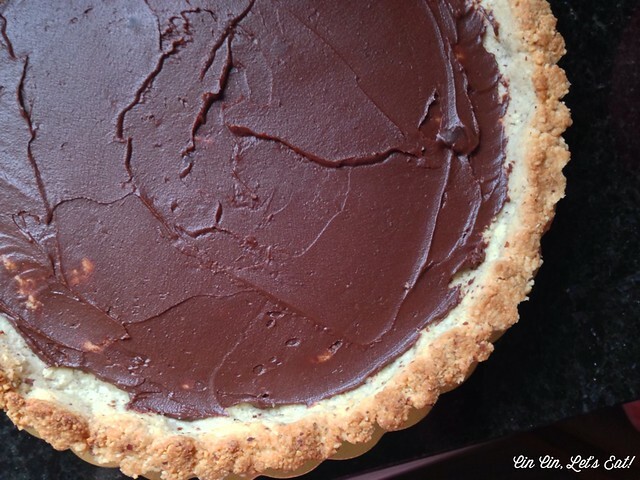 Ganache is ready when it’s at a spreadable consistency. 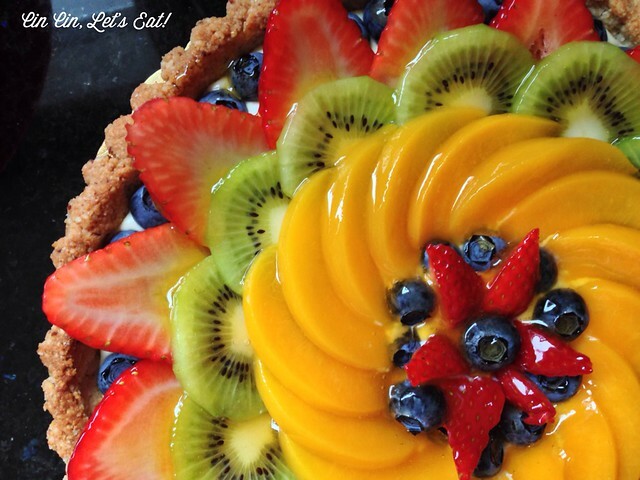 Wash and cut the fruit, and make the glaze while waiting for the tart and ganache to cool. Heat the jam with water until melted, use a very fine mesh sieve (I used a tea leaves strainer) to strain the jam and let cool. You should now have a pure gel-like mixture. Let the gel cool down. 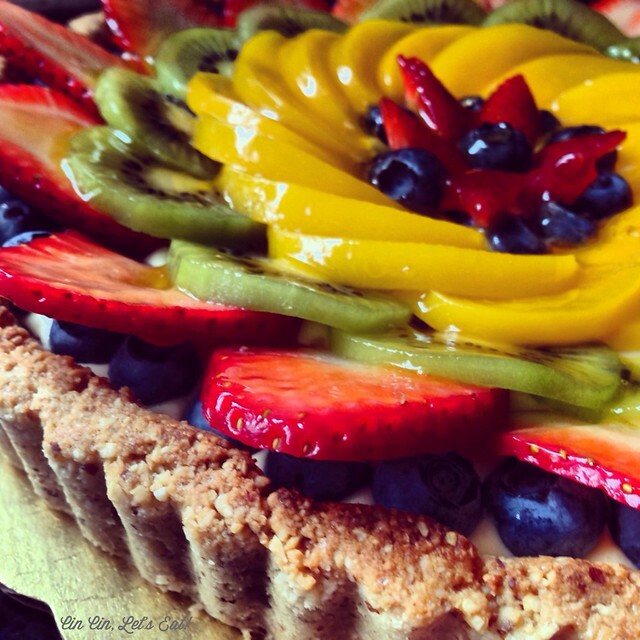 Once the tart is assembled, use a pastry brush to brush the gel onto the fruit for that perfect sheen finish. This is crucial because it prevents the fruit slices from drying, but please don’t bother with using powdered gel or gelatin, they don’t add much and sometimes the texture is off-putting. 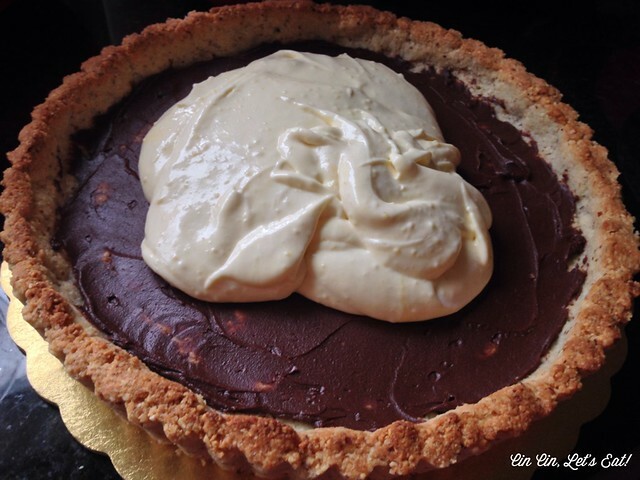 Apply a layer of ganache to the bottom of the tart shell. Start assembling the fruit slices, working circle by circle towards the middle. 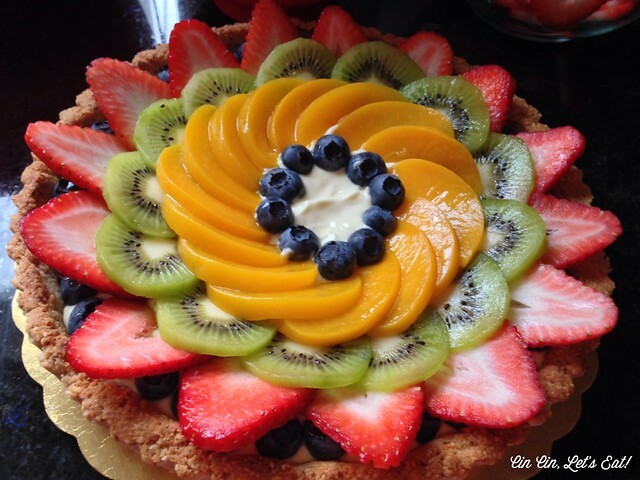 When you lay down the fruit slices, you might be pressing them down thus pushing the pastry cream slightly towards the middle. 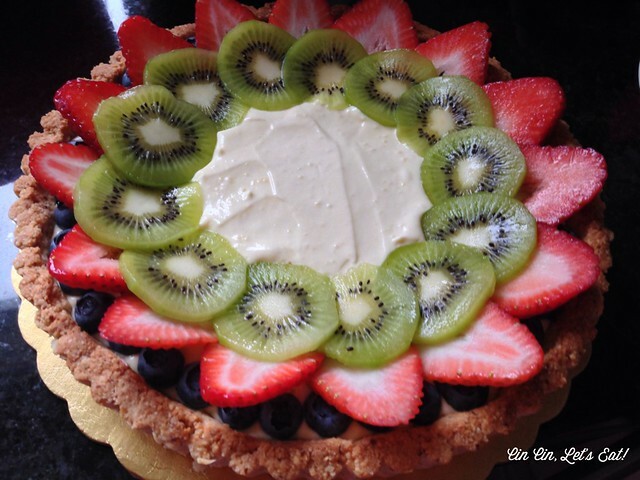 So when you are getting ready to add in the final toppings in the center and the pastry cream is overflowing, just remove a spoonful or two. It looks like it’s finished, but not yet! Don’t forget to glaze it with some jelly. Don’t forget to strain your jam or jelly. Don’t ruin your beautiful dessert with uneven chunks of fruit preserve. Save whatever you have left and mix them with the leftover fruit slices. It’s a perfect snack! The fruit arrangement idea was taken from here. 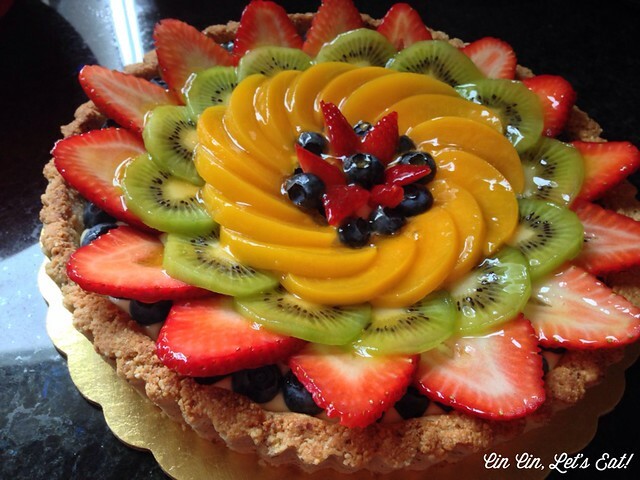 CAN I HAVE A SLICE NOW? Remember to eat your colors! So bright and cheerful! That nutty crust looks so scrumptious! 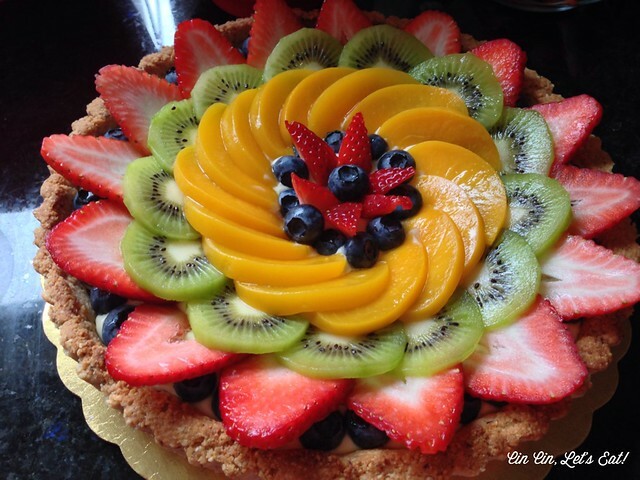 Such a pretty arrangement, though I’ll admit chocolate and fruit feels a little unusual to me. Why not almond filling? This is worth looking for some late-season fruit, just to give it a go. Truly spectaular.